Ian Bogost is a video game designer who fabricates games with an underlying social message. Many of his games contain a satirical element while others can consist of creating awareness about the viewer’s self or social norms changing in the world today. Much of his work relates back to the era when video games were first being established and the free spirit mentality that went along with created them. Guru Meditation is an attempt to create an authentic meditation game using 80s video game materials, the joyboard or joystick. There are two designs of the game allowing people to participate with either of the materials. The joyboard allows the player to situates himself or herself on the device cross-legged imitating the position used when meditating. The screen itself displays a pixelated yogi in the same position as the player on the joyboard. Pixelated nature scenes surround the yogi; the atmosphere around the yogi is scarce but contains a calming array of colors to help induce the state of tranquility. The goal of the game is for the viewer to sit with little to no movement. Over a period of time, if the player has succeeded in minimal movement, the yogi on the screen slowly begins to rise. The yogi’s height is dictated on the player- if the player moves the yogi begins to fall and if the player remains still the yogi will continue to rise­. The yogi rising is to encourage the viewer to continue in their stagnant position. Time passes subtly within the game to allow the viewer to remain in a state of consciousness without distraction. The clouds move over time and the times of day slowly begin to change from day to dusk and night to dawn. It does not matter if the yogi is rising or falling, the scenery will continue to change giving the visual element of time passing. The ideas behind this are to emphasize the relaxing essence of the game by having minimal effects in order to entrance the player but not overwhelm them. Guru Meditation can help embody the experience and show the actions of meditation. Guru Meditation pays homage to the Amiga computer created in the 1980s. Originally designed for video games the Amiga slowly transitioned into a personal computer. Ian brings attention to the folklore behind “Guru Meditation” and repurposes this concept into a meditation game for viewers. The folklore behind Guru Meditation is that during the development of Amiga it was known to crash and the developers would be so frustrated that as a relaxation technique they would try to sit as still as they could on the joyboard created to go with the Amiga. The term Guru Mediation is used when an error message is displayed on the Amiga, which is what caused the frustration for the developers. 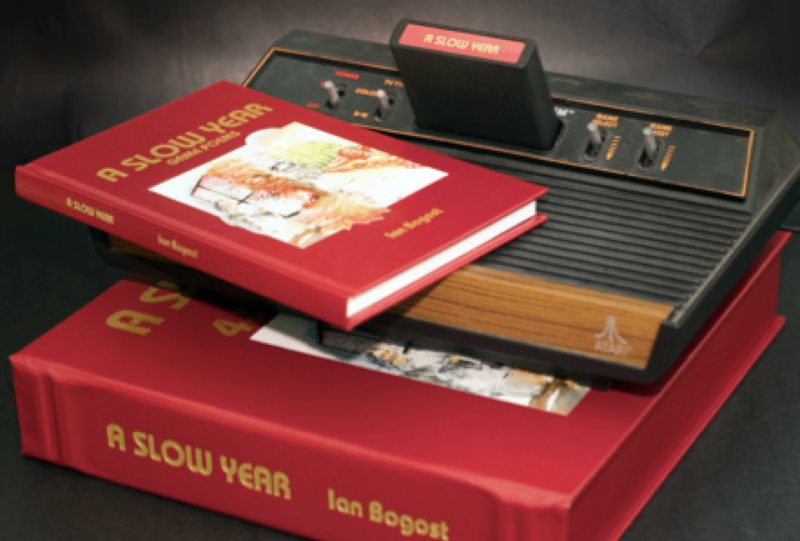 Bogost’s inspiration derives from this lore and uses the story to integrate it into his work by creating a meditation game with the joyboard itself. Drawing inspiration from the Amiga lore Ian designs his game to fit the "retro" mold of games from the 80s. This brings attention to the origins of computer development and game design that has long been forgotten due to the increase of and normality of technology today. Bogost describes that there is often a forgotten connection between Silicon Valley and the hippie counter-culture. For many years there was a connection between Silicon Valley and spiritualism that worked together to create a new age of liberalism with high-tech. Much of the world today has created a stigma around the video games and the people who play them-usually being people who play games for an endless amount of hours. Guru Meditation is an example of a video game defying the stereotype and creating a game that has the intent to interact with the viewer in an abnormal way. Relating to the purpose of Guru Mediation. The game flOw mixes together the elements of an interactive game with the characteristics and tools used in meditation. flOw is used as a meditation simulator in order to sooth the player with hypnotic music, calming lights, and a minimal game design layout. Despite allowing the viewer to experience meditative qualities within the game there is also a structural component to the game itself. The player controls a small organism throughout an aquatic environment as it searches for food to eat. The organism can eat other organisms smaller than it as it travels through the simulation. Each small organism plays a role in determining where the organism travels; red organisms will take the player into the lower depths of the ocean while the blue organisms rise to safer areas within the atmosphere. When the organism rises or falls the atmosphere and audio change with it to complete an immersive game. The farther down the organism travels the darker the ambiance gets and the more ominous the music becomes. The opposite happens when the organism chooses to rise within the environment, creating an airy and calming atmosphere while playing melodic meditative music to symbolize the organism being out of danger. flOw possesses qualities like guru meditation by trying to create a soothing and calming environment however the difference is that flOw lacks the true essence of meditation and fails to collaborate this element within the game. The reason flOw struggles to fulfill the role of a meditative game is due to the amount of interaction needed in the game itself. The player must consistently be controlling the organism and having to catch food, while this act can be meditative itself by aimlessly collecting food the ‘fighting and danger’ component creates a disruption in the meditation process. The lower the organism travels in the aquatic environment the more dangerous it can face as it meets larger organisms and has to fight to fend them off. This action takes away from the meditation as the player has to be alert and aware of his or her surroundings when playing the game and to make the conscious decision to protect the organism itself. Guru Meditation allows for a game to be interactive without adding extra components that could distract the viewer from the ultimate goal: relaxation. Guru Meditation only requires one act: to sit still, this allows a player to concentrate on being still but still allowing for their conscious to wonder without focusing the entire time. The player can successfully enter a state of calm relaxation due to the guidance of the game. A Slow Year: Game Poems is an earlier work by Ian Bogost that is a collection of four different games made for the Atari computer. The work itself is delivered in a book containing four games, essays that discuss the similarities between video games and poetry, and lastly over a thousand haiku's generated by a computer. This art piece contains more features that Guru Meditation they both are used as a remembrance for ‘old-school’ computers and achieve the aspect of minimalism- through concepts and pixelated art designs- in each game. A Slow Year achieves this by creating a limited amount of scenes and interactions within the game. There are only four scenes displayed-each one being a season. The intention behind the game is to create a comforting environment for the viewer allowing them to reflect on their current reality. Much like Guru Meditation, A Slow Year helps to create a soothing environment to allow the viewer to reflect amongst oneself. Bogost attains this in both games by creating a simplistic game in both visuals and concept. The difference between the two is that Guru Meditation does not aim to have the viewer reflect on one specific thought but rather to help the viewer be able to maintain a still and calming action giving the ability to have the viewer relax and reflect. As for A Slow Year its entire display of the product, including packaging, give a nudge to the idea of reflecting on time and the connection between video games, poetry, and life. The three games vary in design and structure but all allude to the ability to create a game that generates an emotion or concept within the game itself. The games combat the stereotype behind video games today and provide an example of an interactive and soulful game. Exhibitions: Can be experienced by ordering the physical game or downloaded as an app onto a smart phone.